Micro-needling is a treatment that uses small needles to cause tiny punctures in the skin. These small contact points encourage the body to create a wound healing response as well as tighten, lift and rejuvenate the skin. As your skin repairs, the production of collagen and elastin is triggered to give an almost immediate plumping and firming effect. It can also tackle other skin damage problems such as scarring, dark marks, sun damage and ageing. 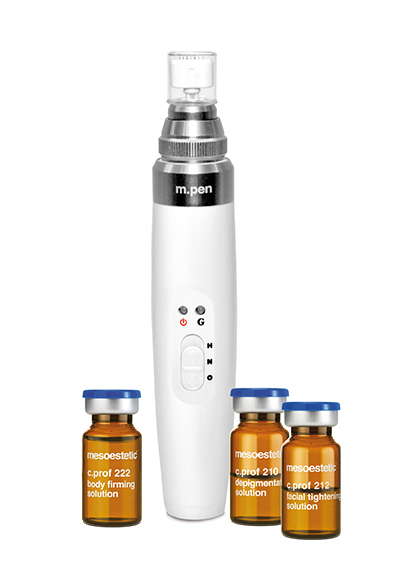 The micro-needling technique tricks the sensory nerve endings in the skin to think they are being vibrated and not needled, resulting in a virtually painless treatment. This is followed with a relaxing application of mask and serums. The treatment will last for 1 hour. The device reduces pain and downtime by minimising epidermal damage, which makes the treatment more comfortable. You can return to work as normal. Micro-needling stimulates your skin to produce new collagen and enhances the penetration of active ingredients. Results will appear gradually in the weeks following treatment, the skin will look smoother, firmer and younger. Fine lines, wrinkles, stretch marks and scarring can be diminished.